Victorian premier Denis Napthine has promised a Coalition state government will build a rail link to Melbourne Airport if it is re-elected in November. Dr Napthine said May’s state budget would include funding for plans for the rail link which would run from the airport to Albion before linking in with the rest of the Melbourne rail network to Southern Cross Station. It is expected services would depart every 10 minutes during peak times, with trips taking about 25 minutes. The Premier did not outline a timeframe or budget for the project. A 2013 study by the state government body Public Transport Victoria recommended an airport rail link follow a modified “Albion East” corridor design. 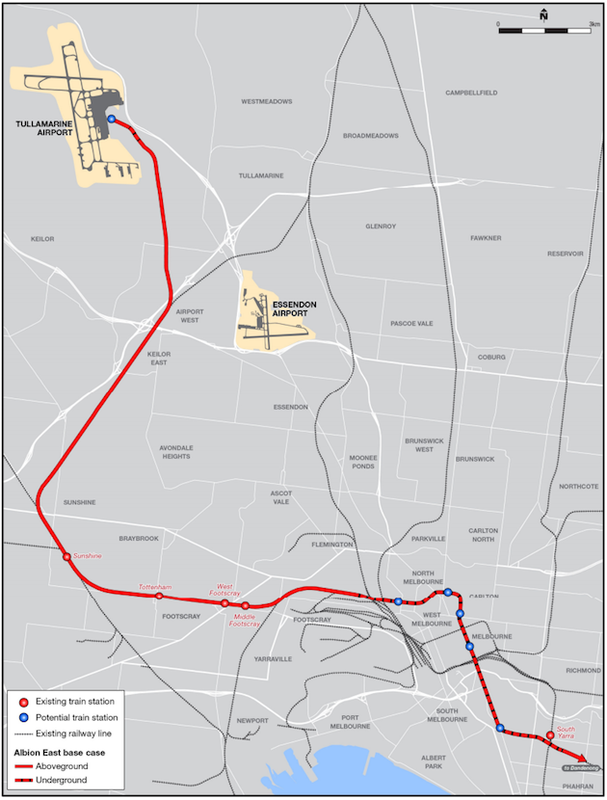 Diagram showing the Albion East design rail link to Melbourne Airport. What to say of the real possibility that the Napthine government won’t be re-elected. What happens to the rail link idea then? Sitki Esenyel – Labor should match the promise. I hope so Raymond. It’s been a long time coming. Finally, at last a rail link. As a frequent traveller to melbourne, normally by my self, a train service should have been done years ago. I cant think of any major airport (domestic or international) that doesnt have a rail link. I thought it would connect to Southern cross or flinders st., directly thou..? Getting into the city quickly and not via the Tulla fwy parking lot will be a blessing. to build second Sydney Airport. With this projects, life to traveling people and general public will be much easy. Congratulation and greeting from Serbia. Rodney Marinkovic, AME. Kraljevo / Sydney.